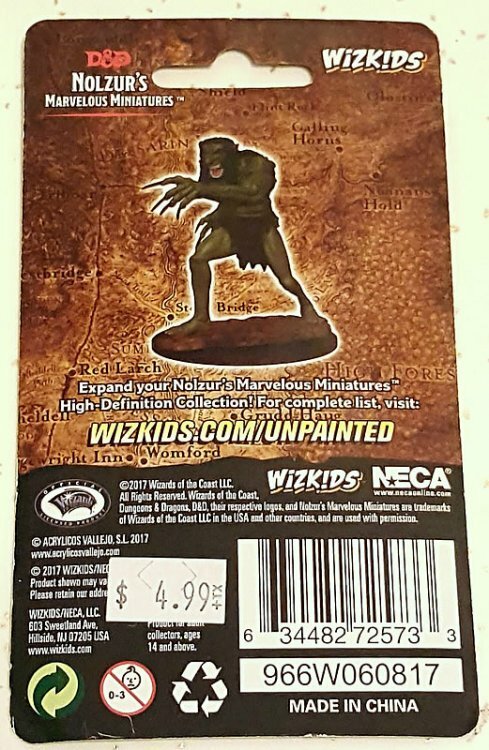 Troll :: Wizkids :: D&D Nolzur's Marvelous Miniatures™ :: Thrym WIP # HOAH! 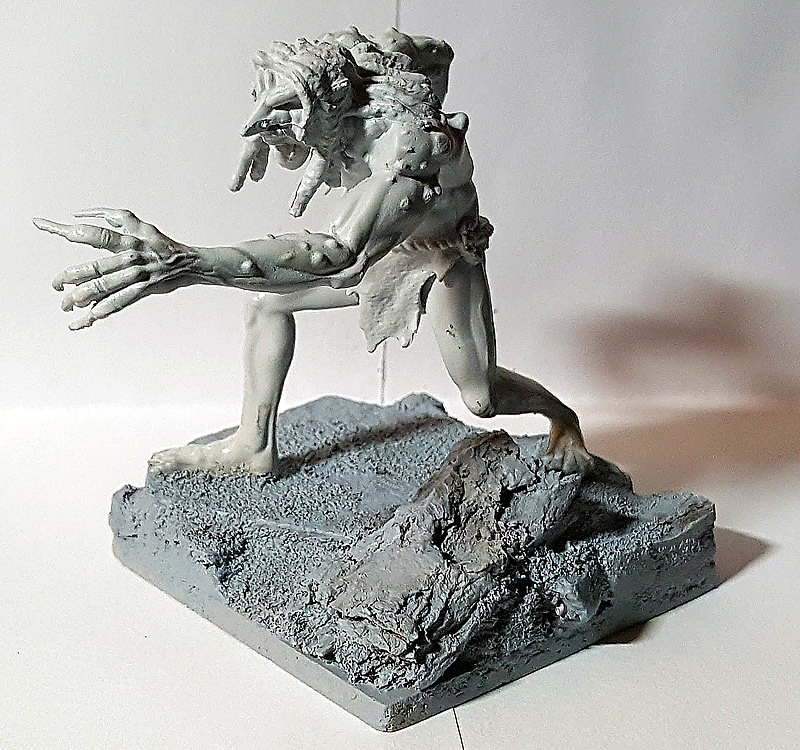 Troll Troll :: Wizkids :: D&D Nolzur's Marvelous Miniatures™ :: Thrym WIP # HOAH! As I stated, I am working on a lot of projects involving the various Joten Horde I command and so I managed to acquire this one on Black Friday at my FLGS, Millennium, in Rochester, NY. This appears to be a direct response to Reaper's Bones line. It comes pre-primed with Vallejo Grey Primer and that wafer thin base AND the integral base. 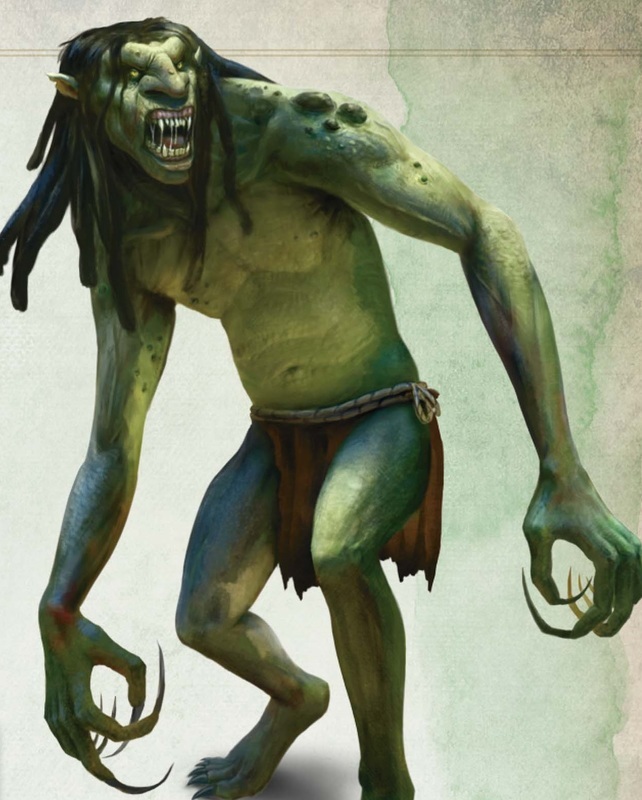 As you can see this is a classic Dungeons & Dragons portrayal of a troll. I've always enjoyed this kind and have a couple of classic trolls from TSR in the same vein. As I mentioned, I above, he came with a really thin base to put him on and the integral base. Wasn't a fan of either so I cut the integral base right off and glue him to a piece of shale to add some weight to the miniature. I also glued that to a architectural tile sample. Then added some bark. One piece to represent a log coming from below the rock he's standing on and the rest to increase the uneven terrain feeling. I added the course and fine sand to give the whole thing some texture. Afterward, I sealed the whole base with a quick coating of Testors Dullcote and then primed it by hand with some Reaper Grey Primer. It says high-definition and it certainly seems to be of very good detail. You can see a nice definition with the knuckles and veins on his hands and wrist. That said, what annoys me is the mold line through his left cheek and his hair. The rest of them are in the usual spots, along his chest sides and either side of his limbs. 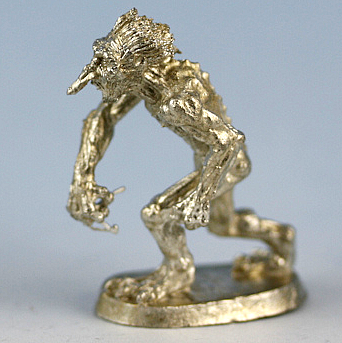 The price point for the Bones Trolls compared to this troll at the store ($5) are roughly the same. I look forward to adding him to the crew and I think I might continue my Abomination style skin on him that I used for the Mountain Troll, The Skull Collector. I've started painting this mini myself though I haven't touched him in a few months, so I'm curious to see what you do with yours. 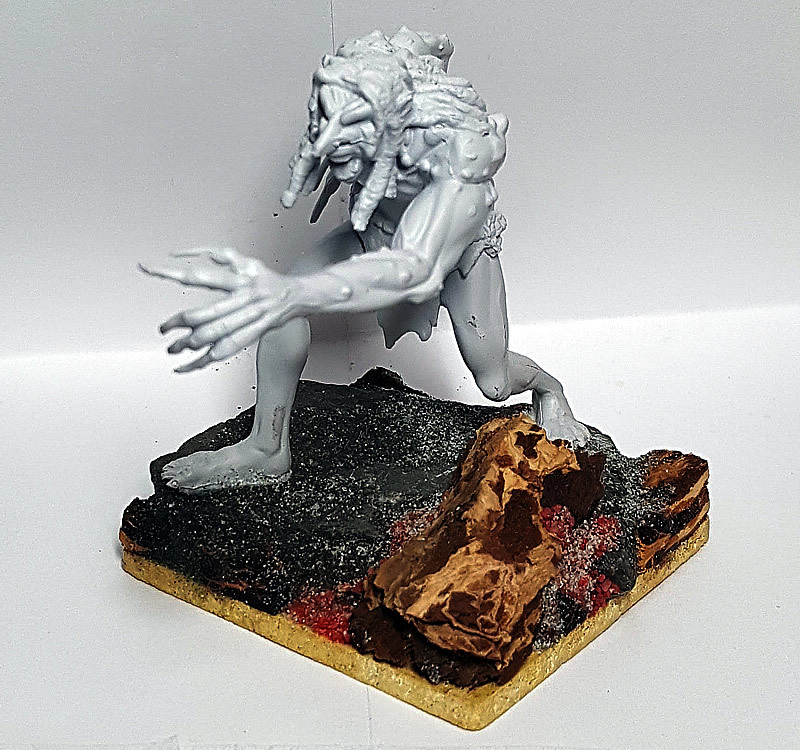 Like you I'm a fan of this style of troll but not a fan of the very thin bases they provide and I've noticed that frustrating placement of mold lines occurs on several of their minis. I'm not crazy about the sculpt and style; he's just too human looking... but I'm ready to see someone do something good with him. I think it's the lanky old school D&D style with the nose overlapping the mouth and forward jutting face. I have two and both are actually painted up. Not great but not bad. I am fairly certain they are shorter than the fellow above and most of the Reaper trolls. Oddly I love the thin round bases. I'm hoping Wizkids will start selling those by themselves at one point. Still love the new base you've constructed for him. After the response to my other post, I figured I could post my campaign here. I'm gonna be using spoiler tags for DM notes, just in case people want to follow along. Red Sash - Warforged Paladin. Currently trying to earn money for the Cyran refugees. Was a medic during the war and is still not sure exactly what to do now that it is over. Son of Bork - Warforged Barbarian. If you want to know his backstory, see here. Warning: untagged spoilers in link. Thicket - Shifter Rogue. Currently over his head in gambling debt to Draask. Lell - Gnome Warlock. Member of the Trust of Zilargo. Suddenly, a fire breaks out and there are patrons running about. The elf at the bar sneaks out the back, and Lell gives chase with Son of Bork quickly giving chase after Lell. Thicket, not wanting to be involved in the fire, rushes out of the back of the bar as quickly as he can. Red Sash, meanwhile, attempts to save a patron surrounded by fire by walking directly through the fire. Thicket runs into a man he'd been caught cheating against - a muscular dwarven fellow by the name of Kiel Tarvernworth and promptly turns around, catching up to Lell in the process, as Son of Bork had managed to catch Lell and pick him up (again). The two make a deal, and Thicket shifts to catch the elven fellow while Lell negotiates with Kiel, convincing him to wait for them later by giving him a 1 Galifar (gold) down payment on Thicket's debt to the man. Thicket manages to catch the elf, and Lell interrogates him only to find out he was only a guest lecturer at the university and didn't want to get caught up in the fire. They let the elven man go. Meanwhile, Red Sash fails to convince the man to let him save him, and the patron blinks away quickly. Frustrated, Red Sash starts to gather volunteers to put out the fire and aid the tavern. Lell, Son of Bork, and Thicket also help with relocating the stock in return for the promise of coin. The fire out, the group goes their separate ways.